I finally finished my epp hexagon pillow! 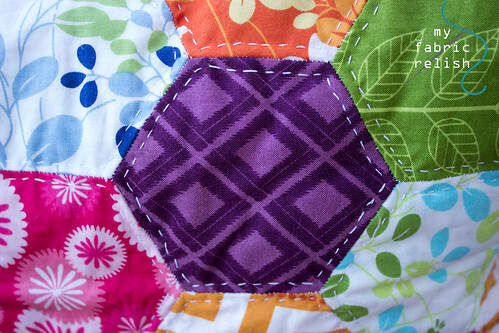 I first showed you some of the 2 inch hexies pieced together here. Well, that was two months ago! I probably wouldn't have finished it except that my dad has been in the hospital for two weeks and I've had a little free time (while the relishes are at pre-school) sitting up there keeping him company. He is feeling better, but will likely have heart surgery later this week. With that said, I have had very little time/energy to sew. I also started a new EPP project today while sitting at the hospital. I am excited about this one! It has hexagons, squares, and triangles, oh my! I didn't take a picture today, but maybe I will tomorrow and blog real quick from my ipad. I did finish Mr. 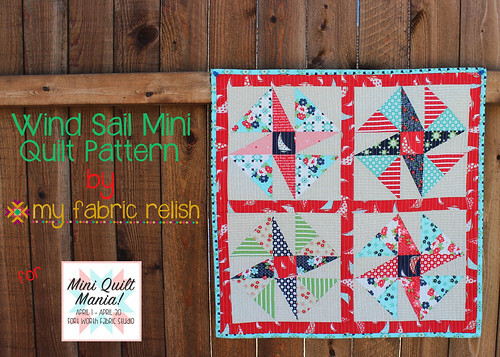 Relish's anniversary quilt but I'm saving that post for next month for Sew We Quilt's blog hop, For the Boys! Wooohooo...my first blog hop! Stay tuned for that, but just so you know, he LOVED it! I am also liking up over at Hydee Ann's (<--love her name!) 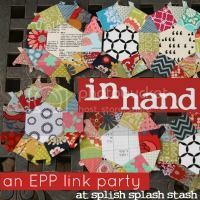 new monthly EPP linky party at Splish Splash Stash! You must go check it out this Saturday! Hi, Hydee Ann! Lastly, while I was taking pictures of my hexagon pillow early this morning (see the dew? ), I also snapped a picture of little relish sporting her first pony ever! Isn't she adorable? That's all I got for you this week. Thanks for visiting! 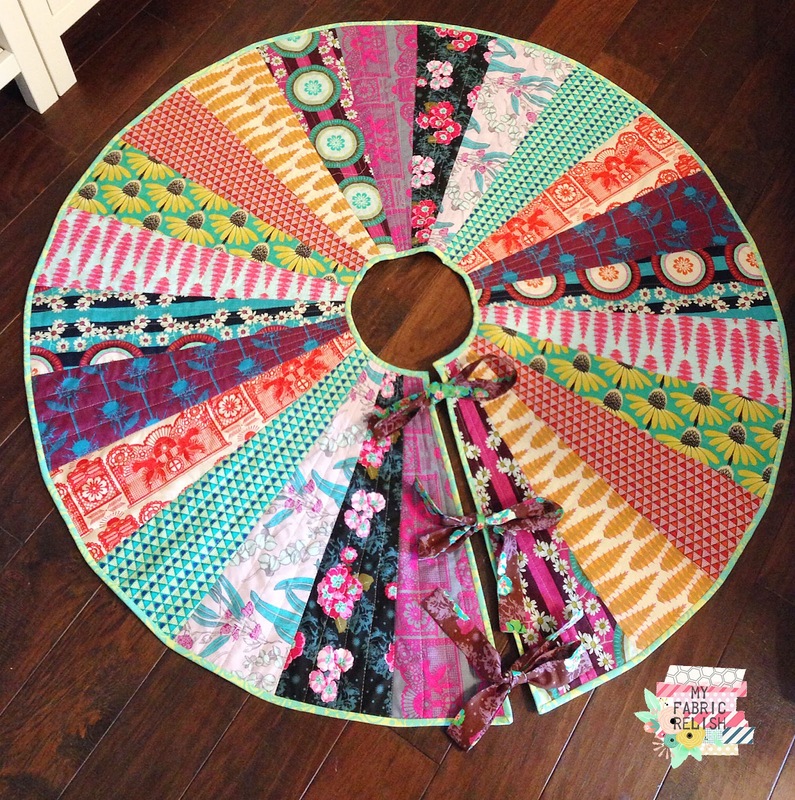 Linking up with all my linky friends to the right, Crazy Mom Quilts and over at Quilt Matters for TGIFF! Little Relish is seriously adorable! Love the pony. :-). Your pillow is awesome. Great job on the finish. And I hope daddy feels better real soon. Thanks so much! I'm so glad I have a finish to link up this week. Thanks for the visit and sweet comments! Little Relish brings tears to my eyes with her sweetness! I love your pillow! I can't wait to see Mr. 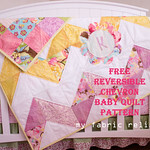 Relish's finished quilt! Congrats on your upcoming blog-hop. 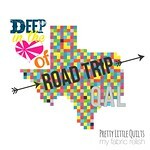 Can't wait to see Quilts for the Boys! 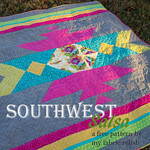 My husband is due for a quilt and looking forward to being inspired! A prayer going out for you and your Dad. Aww....Thank you, Debbie! Little relish is quite the charmer and she knows it! Thanks for the visit, sweet comments, and prayers....all very much appreciated. What a sweetie. My baby girl had the same hairdo and we called her pebbles....she just turned 40. Terrific pillow. Thank you! I think that is about the cutest hairdo on the planet! Thanks for the visit!! I love it! The hand stitches are perfect. I love Simply Color too. Thank you!! I'm so glad simply style is so similar! Can't get enough!! Ahhh, now I see! You have your For The Boys quilt finished already. Love your hexagon pillow. I'll bet your dad sure appreciated the time you spent together. Praying his operation goes well. And sweet pic of the baby relish! Haha...yes, it's all finished! I actually had the post scheduled to publish but then got added to the blog hop. Whooohooo! Yes, I brought the finished pillow to share with the nurses and my dad to show what I had been stitching. Haha! His surgery was today and everything went good. Thanks so much for the prayers! I love the bright colours of your pillow. Hugs to you and your dad. Pretty pillow and I love the hand stitching. Little relish is very cute. Aww, thank you! I think she knows she's quite the charmer. Thanks for visiting! hi back atcha! thanks for linking up. 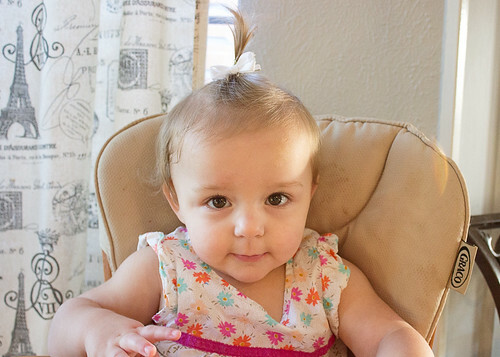 =) little relish's first piggy tail is so cute. that's a milestone i've documented with each of my 5 girls. thanks for the tip on the 2" hexies and the charm squares. i was wondering how charms might work with epp. 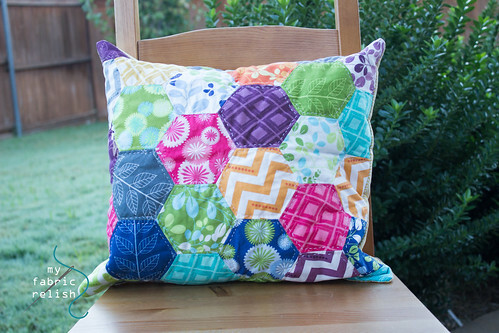 love the hand quilting on the cushion! hope your daddy feels better and surgery goes well for him. can't wait to see your new project. 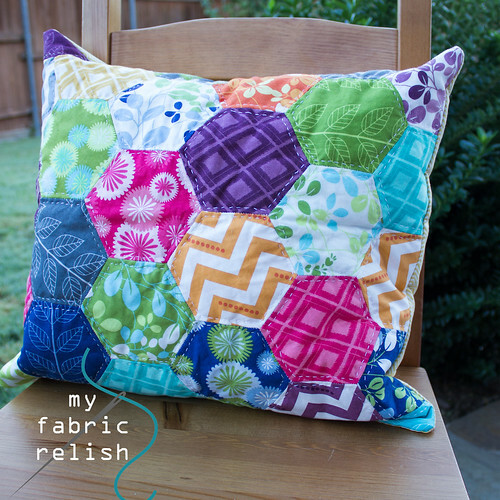 I love the finish your hand quilting gives to your pillow. Thank you! It took a bit of time but well worth it! How on earth one does a whole quilt? Thanks for stopping over for a visit! Love your hand quilting on the pillow, it makes it even more special. Thank you so much! I'm glad I forced myself to do it by hand. I wasn't very even with my stitches but I kinda like that part. Thanks so much for the visit, also! Hi Melissa, great hexagon pillow! I'm glad you linked up to TGIFF!, but to be eligible for the OctoberQuest 2 prizes, you need to include a link to the TGIFF! party in your post, not the sidebar. Please do link up again once you've done that. We'd love this finish to be eligible! Trying to catch up on blog reading. I love your pillow. 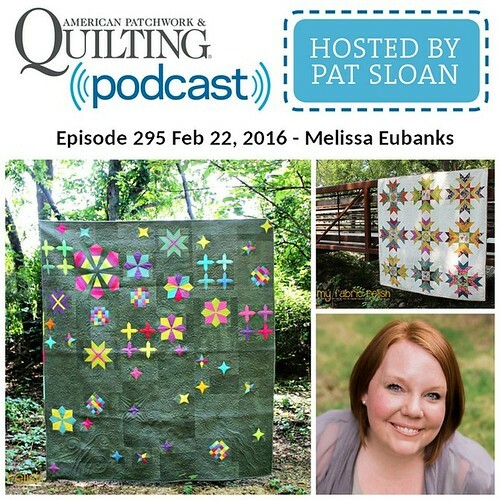 Love love the hand quilting. Great job. Your hexie pillow is awesome! Does the little cutie like to lie on it?